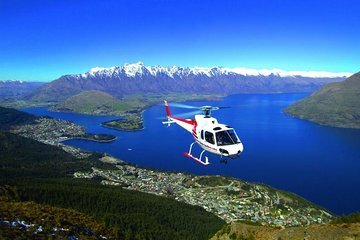 Discover the best views of Queenstown from 5,000 feet (1,524 meters) on a 20-minute helicopter tour. Look down upon vast Lake Wakatipu and make an Alpine landing in the Remarkables Range, with Coronet Peak and Cecil Peak in the distance. It's a sensational photo opportunity. Hotel pickup and drop-off included. We can pick up from all accommodations in Queenstown centre and surrounding. Select from several departure times and head to the helicopter base after pickup from your centrally located hotel in Queenstown. On arrival, you'll be checked in before you board the modern Airbus Squirrel. Then slip on your audio headset to hear the pilot’s commentary clearly and take off on a scenic 20-minute flight. Soar above serene Lake Wakatipu and the rugged backdrop of the Remarkables, a range in the Southern Alps. You'll land for 10 minutes on a spur overlooking Queenstown, Coronet Peak, and Cecil Peak. Amid the snowy surroundings, snap photos of the panoramic views. Then it's back in the helicopter for your return flight to the base and a transfer back to your hotel.